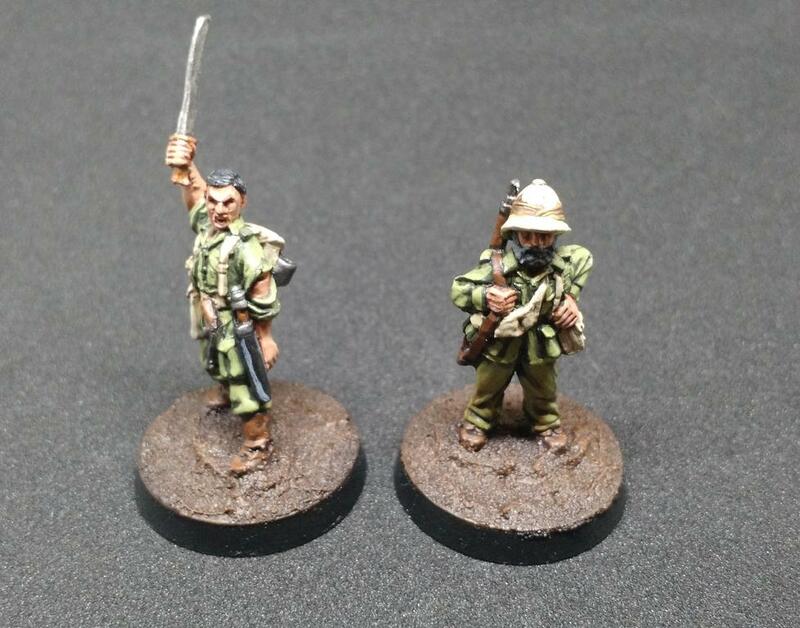 Project updates for my Bolt Action Chindits army. The force is built around a core of infantry with a few support weapons and light vehicles. I’ve finished up the command squad and a few teams since the last update. The basing is still not finalized. I like the dark brown as a first layer and plan to add some kind of foliage on top. Something that will brighten up the bases. I will be repainting the black rims to a lighter shade as well. Possibly a midtone brown. One of the finished support weapon teams is the Boys anti-tank rifle. I had to break my consistent basing with this team. As a rule, all two-man teams are on 40mm bases and three-man teams on are 60mm. 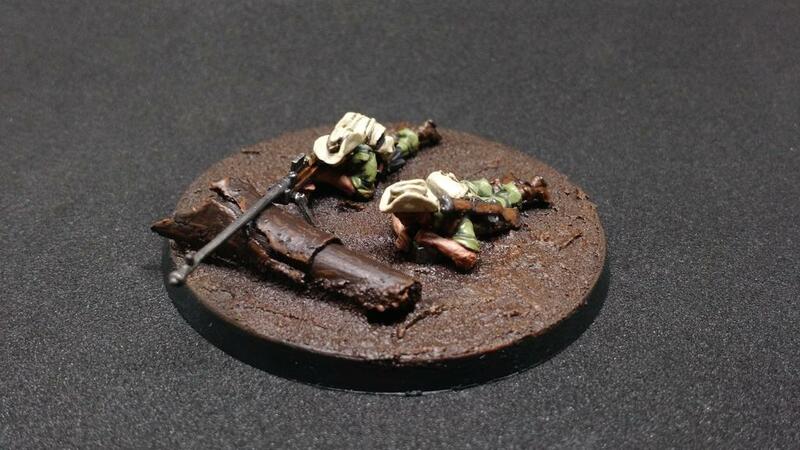 But, due to the length of the AT rifle and the fact that both team members are prone, a 40mm base was too small. The AT rifle stuck out well past the edge of the base and left little room to add any scenic elements. The second support weapon is the ever popular flamethrower team. The use of flamethrower teams has always been a point of controversy in Bolt Action, especially the vehicle-mounted version. Most events and tournaments ban all vehicle-mounted flamethrowers but do allow for the infantry team. Infantry flamethrowers only have a 6″ range and 33 percent chance to run out of fuel after each shot. With this in mind, they are high risk, high reward. I modeled my team to have the operator blasting away with the assistant directing fire over his shoulder. I did a bit of converting on the assistant to get the pose and I am happy with the result. The clear lining around the bases will be covered once the basing in finalized. Four riflemen finished. The bulk of the army will be veteran infantry armed with rifles and I am striving to not have a single repeated pose. Easier said than done when working with a rather limited supply of metal models. Luckily there are several companies that have a Chindit range and I have been able to keep a good variety so far. 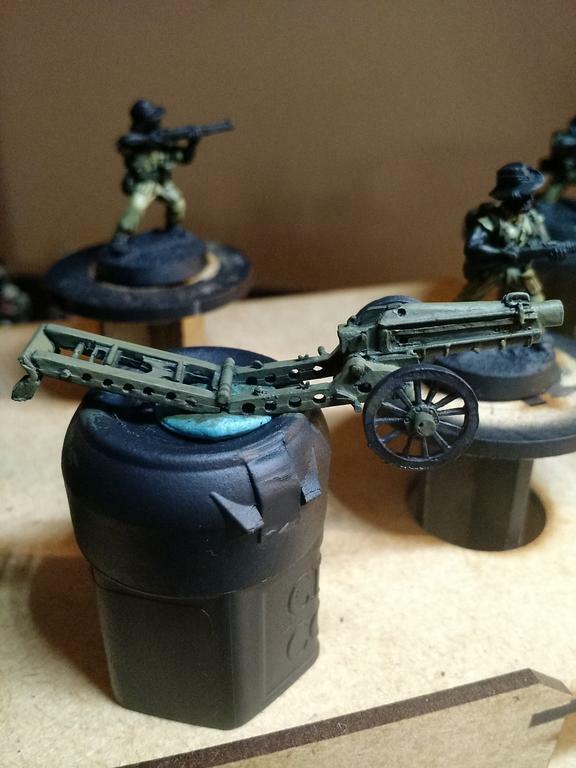 After doing a bit of research on 75mm Pack Howitzers I discovered that the gun is almost entirely green. I initially thought there would be black or metallic bits on the model but I was wrong. Keeping this gun accurate mean keeping it green. This particular version is on wooden wheels, as opposed to the big rubber tires that are often seen, and I am not sure if I will paint them black or brown yet. The lieutenant is just about finished. I need to clean up the shoulder-slung pouches and finalize the basing details but other than that, he is ready for battle. 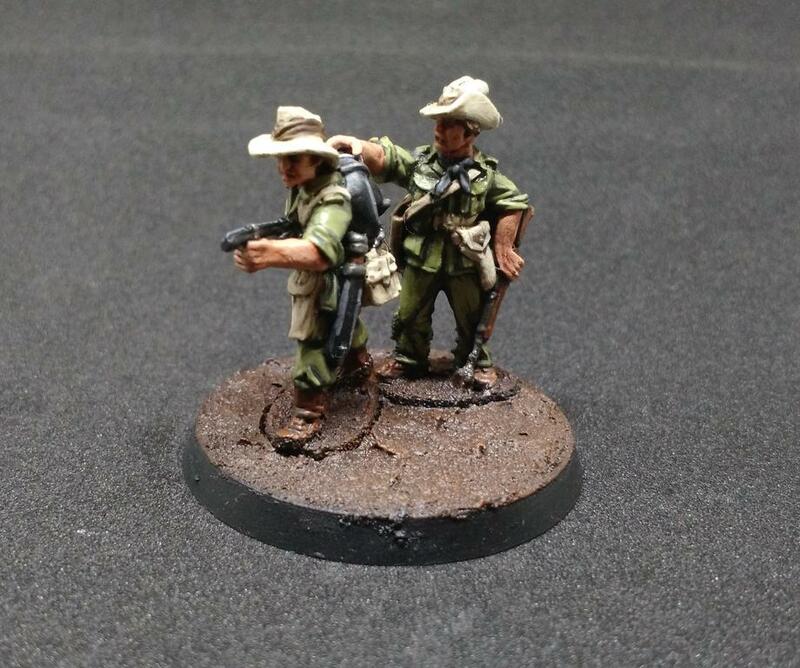 Unlike many of my army projects this Chindit force will contain models from several different companies. 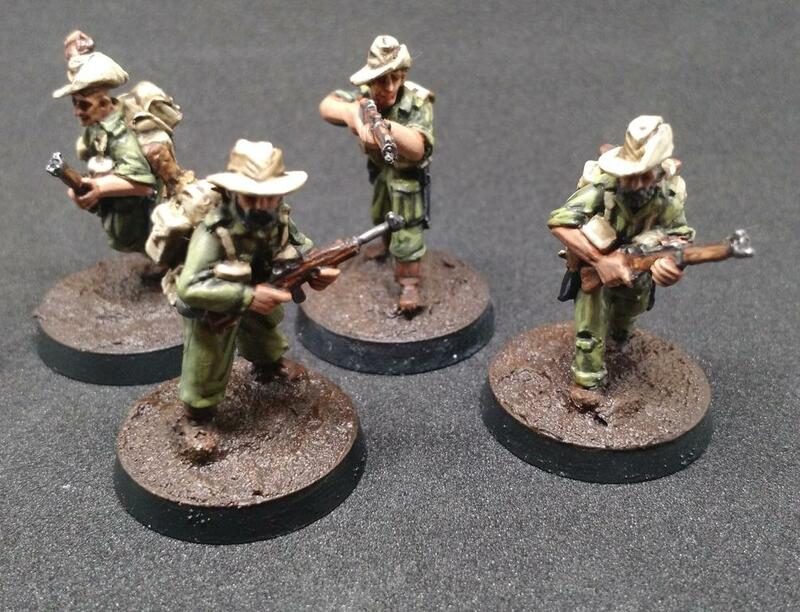 The bulk of the force is made up of Warlord Games Chindits but I am supplementing the ranks with a set of Chindit rifles from The Assault Group in order to add more variety. One of the drawbacks to metal models is the lack of options when building the model. Thus to make sure the army does not contain any repeated poses, I will be adding models from other companies. Good progress on a batch of infantry. The uniforms, webbing and backpacks are by far the most time-consuming steps. After this, it’s all details. To provide some anti-tank support, however light, I am going with a light howitzer from Company B. To keep the support team thematic for Chindits I am not taking anything heavier than a 75mm pack howitzer as this is the only gun they were able to carry through the jungle, usually on the back of a mule team. I’ve added an ammo box and will be doing some simple head swaps to Warlord Chindits to better match the bulk of the force.